UPDATE (Sept. 29): This week AB 2530 was signed into law by CA Governor Jerry Brown and will take effect on Jan 1, 2013 (read more here). A bill opposing the shackling of pregnant prisoners, AB 2530, has been passed unanimously by the California State Legislature and is now on Governor Jerry Brown’s desk, with thirty days to either approve or veto it. Last year, a previous version of this bill was also passed unanimously by the Legislature, but it was ultimately vetoed by Governor Brown. With Governor Brown’s decision expected anytime, local activists are urgently mobilizing to stop him from vetoing this important bill once again. AB 2530 supporters have created a webpage for the public (not just California residents) to contact the Governor. Take action here. As this bill sits on Governor Brown’s desk, we take a closer look at AB 2530, similar bills in other states, and the broader experiences of pregnant prisoners throughout the US by speaking with Tina Reynolds and Vikki Law from WORTH's Birthing Behind Bars campaign. Tina Reynolds, who herself gave birth while incarcerated, is co-founder and co-chair of Women on the Rise Telling HerStory (WORTH) and an adjunct lecturer at York College/CUNY. She is a co-editor of Interrupted Life: Experiences of Incarcerated Womenin the United States (UC Press 2010). Victoria Law is a writer, photographer and mother. She is the author of Resistance Behind Bars: The Struggles of Incarcerated Women (first published by PM Press in 2009, with a new updated version released this month), the editor of the zine Tenacious: Art and Writings from Women in Prison and a co-founder of Books Through Bars - NYC. Her latest book, just released this month, Don't Leave Your Friends Behind (PM Press, 2012) addresses how social justice movements and communities can support the families in their midst. Learn more about upcoming book-release events here. There will be a special performance of MUNCHED in New York City on September 9, as a benefit for WORTH. Learn more here. Angola 3 News: What does shackling during pregnancy entail? Tina Reynolds and Victoria Law of Birthing Behind Bars: Imagine a woman who is actively in labor. She is handcuffed. Attached to those handcuffs is a chain that links the handcuffs to a chain that goes around her belly. Attached to that belly chain is a chain connected to shackles around her feet. This hampers her movement tremendously. If you've ever seen old movies depicting chain gangs or prisons, you've seen some version of shackling. When people who have their legs shackled attempt to move, they hobble slowly since the leg shackles keep their feet and legs together. You can imagine how dangerous this is for a woman who is actively in labor and is going to need to both move around and eventually be able to push a baby out of her body. A3N: What arguments do you make in opposition to this? BBB: First, shackling or otherwise restraining a person who is in labor and delivery is inhumane, if not torture. International organizations have recognized this as a human rights abuse. In 2006, the UN Committee Against Torture alerted the US government that shackling during childbirth is a violation of the UN Convention Against Torture, which the US is a signatory of. It should also be noted that Rule 33 of the UN’s Standard Minimum Rules on the Treatment of Prisoners states clearly that chains and/or irons should never be used as restraints. Secondly, shackling or otherwise restraining a person in labor and delivery is dangerous both to the woman and to the baby. Medical professionals have recognized and spoken out against these practices: The American Medical Association adopted a resolution opposing shackling as a medically hazardous practice. The American College of Obstetrician and Gynecologists, the American College of Nurse Midwives, and the American Public Health Association have also condemned this practice. A3N: How often are pregnant women prisoners forced to wear shackles during birth? Is there documentation of how many pregnant prisoners are forced to do this? BBB: As far as we know, there is no documented percentage (that is publicly available) of how many women prisoners are shackled during birth. What we do know is that 34 states currently have no protection against shackling pregnant prisoners while they are in labor or delivery. That means that it is up to the jail or prison staff as to how and if the mother will be restrained while she is in labor, while she is being transported from the jail or prison to the hospital, and how she will be restrained once at the hospital. In addition, mothers undergoing delivery via c-section are often restrained both during and after the surgery. These decisions are not made by the medical staff. As of 2011, in many of the states that have no protections against shackling and restraining women during childbirth, the input of medical staff does not need to be considered. We also know that five to six percent of women entering jails and prisons each year are pregnant. Many will spend the duration of their pregnancies behind bars, which means that even if they do not give birth while incarcerated, they must rely on the prison’s prenatal care, which is often inadequate and sometimes can jeopardize their pregnancies. A3N: Compared to shackling the legs, how much safer is shackling of the hands, or any other method used? Do you know often these are used instead? BBB: We’re not sure how often other methods are used instead of leg shackles during childbirth, but part of the campaign is recognizing that using restraints on a woman who is pregnant and/or actively in labor and childbirth is dangerous. For example, in Massachusetts, the Massachusetts Department of Corrections has stated that they do not shackle women who are in labor (thus anti-shackling legislation is unnecessary). Their current policy is that the restraints used on women who are in labor and delivery should be the “least restrictive” and should not be waist or leg restraints. But this doesn’t mean that there aren’t dangers to restricting a pregnant women’s movement. When walking, pregnant women, especially in their third trimester may have balance issues, and if they trip and fall while handcuffed, they will be unable to catch themselves. When transported in a van while handcuffed, if jostled, they will be unable to catch themselves from falling or bumping into something. It’s also important to note that Massachusetts’s “less restrictive” policies came about because of a 1992 consent decree, McDonald v. Fair (CivilAction No. 80352), not because the Department of Corrections realized the hazards and immorality of shackling pregnant women. It’s important to remember that we cannot wait for prison administrators and legislators to see the light; we have to constantly remind them that shackling pregnant prisoners is not only a medical issue, but also a human rights abuse that will not be tolerated. A3N: Who are the primary advocates of shackling pregnant prisoners? BBB: The primary advocates of shackling are prison and jail staff (and their unions). Because prison and jail staff have very strong trade unions, whereas prisoners are not a voting constituency, politicians sometimes jump on pro-shackling as a way to court those votes. Last year, pressure from the California State Sheriffs' Association and both Alameda and Sonoma County Sheriffs' departments pushed Governor Brown to veto the anti-shackling bill that had already passed the State Senate and Assembly. Similarly, in Massachusetts and Georgia, the state Department of Corrections has opposed the efforts of advocates and formerly incarcerated women trying to pass legislation to ban the shackling and other restraints of incarcerated women during labor, delivery and recovery. A3N: What arguments do shackling advocates make? Of course, this is fear-mongering and not at all based in reality, as anyone who has ever experienced labor and delivery (whether incarcerated or not) will tell you. We have publicly countered this argument both from Tina’s own experience as a pregnant prisoner and from listening to countless stories of others who have given birth in prison. We have never heard a woman tell a story of wanting to run during labor. It's just not on their mind. Vikki has gone through childbirth (but not in prison), and can tell you that when she was actively in labor, she couldn’t even walk down the hallway without lots of physical support from her partner (and even then it seemed like a herculean challenge). We seriously doubt that a woman in labor is going to summon up the strength to overpower the accompanying guards and medical staff and then run. All of the mothers that we know will tell you the same. There's also the perception that, when a person has violated the law and is sent to prison, she deserves all other punishments that come along with her prison sentence. Women prisoners have historically been viewed as not redeemable and this notion still comes into play when we think about women in prison today. In addition, shackling during transportation outside of prison is practiced regardless of gender. There is no consideration of circumstances and so the health and safety of pregnant women are ignored by this blanket policy. A3N: California’s AB 2530 opposes shackling “unless deemed necessary for the safety and security of the inmate, the staff, or the public.” How serious of a loophole is this qualification? How significant of a step forward do you think this bill is? BBB: The bill is significant because it prevents the CDCR from shackling and restraining women during any stage of their pregnancy, not just during labor, delivery and recovery. It also forces the CDCR to inform women that they have a right not to be shackled or cuffed behind the back during the entirety of their pregnancies. The "unless deemed necessary for the safety and security" clause addresses the fears that prison and jail staff (and their unions) whip up around not being able to restrain women in labor. Of course, it would be nice if it weren't there, but that clause may also mean that jail and prison staff actually have to record the (hopefully few to no) instances in which they do use restraints on pregnant women and actually justify their actions. It's not perfect, but it is a start. A3N: How far have other states’ anti-shackling bills gone with their restrictions on shackling? BBB: In 1999, Illinois was the first state to pass anti-shackling legislation--banning restraints of any kind, including handcuffs and leg irons, from being used on women who were either in labor or being taken to the hospital to give birth. However, prison and jail officials often interpreted labor to mean only the actual delivery, not the hours and sometimes days in labor leading up to childbirth. This meant that pregnant women were still shackled for unnecessarily long periods of time. This past January, following a $4.1 million settlement (thanks to the efforts of Chicago Legal Aid to Incarcerated Mothers, who filed a federal lawsuit on behalf of several women that had been shackled up until the moment of delivery), Illinois passed another bill that clarified its definitions of labor and delivery. It also extended the ban on shackling and restraining pregnant women incarcerated at Chicago's Cook County Jail during all stages of their pregnancy. Several other states have anti-shackling legislation that extends beyond the immediate time period of labor, delivery and postpartum recovery. Vermont’s 2005 anti-shackling legislation states that prison staff "shall not routinely restrain pregnant inmates who are beyond their first trimester of pregnancy in the same manner as other inmates, recognizing that to do so might pose undue health risks for the mother and unborn child." Like legislation in other states, Vermont also prohibits shackling of women during labor and delivery EXCEPT when the prison or jail staff feel that "the inmate presents a substantial flight risk or other extraordinary circumstances dictate otherwise." Similarly, New Mexico's 2009 legislation states that a "correctional facility, detention center or local jail shall use the least restrictive restraints necessary when the facility has actual or constructive knowledge that an inmate is in the second or third trimester of pregnancy." Again, the legislation allows for exceptions if the prison or jail staff determine that the woman poses some sort of security risk. 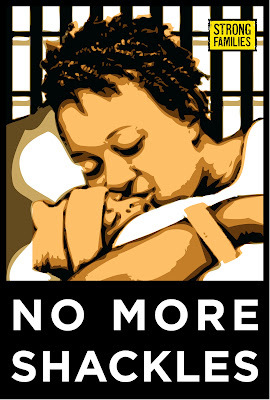 When Rhode Island passed its anti-shackling legislation in 2011, it included a prohibition against restraints starting in the second trimester, a requirement that pregnant prisoners be notified of their rights, and a provision allowing women to file a lawsuit if they are shackled in violation of the law. This last rule is not in any other legislation limiting or prohibiting shackling. However, all of these bills have exceptions that justify shackling for "safety reasons." As far as we know, the "for safety reasons" exceptions have not been addressed by people inside women's prisons or by outside advocates who have been pushing anti-shackling legislation. A3N: Anything else to add regarding the significance of AB 2530 in California? BBB: The California bill is significant because it would extend the prohibition on using leg irons, waist chains or handcuffs behind the body on pregnant women throughout their pregnancy (and recovery from childbirth), not just in the hours during labor and delivery. It recognizes that restraining pregnant women, no matter what trimester of pregnancy that they are in, is both medically dangerous and a human rights abuse. Because there's been more national media attention paid to efforts to pass it, the legislation would also be a model for advocates in other states seeking similar protections for pregnant people in jails, prisons and immigrant detention centers in their areas. As we said earlier, 34 states currently have no legislative protection against shackling or restraining pregnant women during labor and delivery. Of the states that do have legislative protection against shackling or otherwise restraining people during labor, only a few protect women during earlier stages of pregnancy. A3N: What ways can our readers help support the Birthing Behind Bars website/activist campaign, and otherwise take action against the practice of shackling during birth? BBB: First off, if they haven’t already, they can go to our website, www.birthingbehindbars.org, and sign the pledge to help end shackling and other reproductive injustices behind bars when the fight comes to their area. We’re working with the media group Thousand Kites to build a system to contact supporters in certain areas when we know that campaigns addressing reproductive justice in prisons are happening in their home towns or states. We recognize that campaigns to end shackling and other reproductive injustices in prison can’t happen without the women who have been most directly impacted. In 2009, New York State passed legislation to end the shackling of incarcerated women during labor, delivery and recovery. Crucial to the passing of that bill were the voices, insights and analyses of women who had experienced birth behind bars. Members of WORTH, an organization of currently and formerly incarcerated women in New York, spoke about being pregnant while in jail and prison, being handcuffed and shackled while in labor, and being separated from their newborn babies almost immediately. Their stories drew public attention to the issue and put human faces on the pending legislation. From this victory, WORTH members gained a deeper sense of their own power to affect social change. Birthing Behind Bars comes out of this recognition that those most directly impacted must be at the center of the fight for reproductive justice in prisons. The Birthing Behind Bars site provides a forum for women's stories and a way to amplify them to support campaigns for reproductive justice. If you are a formerly incarcerated woman who has experienced pregnancy while behind bars, or if you know a sister who has, get in touch! We want to hear your stories! We want to know: What was medical care like? Did you birth your baby while incarcerated? What was it like to hold your baby for the first time? What happened in the moments after? Women can also call in their story anytime on our toll-free hotline: 877-518-0606 (Don't worry if you make a mistake, we edit all the calls). They can also upload their stories for our site, here. Regardless of whether readers have first-hand experience of pregnancy in prison, we all need to get involved! Currently, formerly incarcerated women and outside advocates in both Georgia and Massachusetts are fighting to gain legislative protection for people who are incarcerated while pregnant. Readers in those states can get involved in the fight and start the process of ensuring a safer pregnancy for women behind bars. We also need to recognize that reproductive justice is not simply the absence of chains and irons during labor and delivery, but that everyone, regardless of what stage of pregnancy they’re in, deserves to have a safe and healthy pregnancy. We recognize that prisons are never going to provide a place for safe and healthy pregnancies; we recognize that we need alternatives to incarceration for pregnant women. At the same time, we also recognize that the city, state and federal systems continue to incarcerate women at all stages of pregnancy. While they are behind bars, they should be protected against the human rights abuses and reproductive injustices currently inflicted upon them. --Angola 3 News is an official project of the International Coalition to Free the Angola 3. Our website is www.angola3news.com, where we provide the latest news about the Angola 3. Additionally we are also creating our own media projects, which spotlight the issues central to the story of the Angola 3, like racism, repression, prisons, human rights, solitary confinement as torture, and more. Our articles and videos have been published by Alternet, Truthout, Black Commentator, SF Bay View Newspaper, Counterpunch, Monthly Review, Z Magazine, Indymedia, and many others.